The LegalTech revolution seems to favor larger departments – though it’s teams of 10 lawyers or fewer who stand to benefit the most from the time savings it promises. By 2 to 10 lawyers, it’s a 50-50 split. 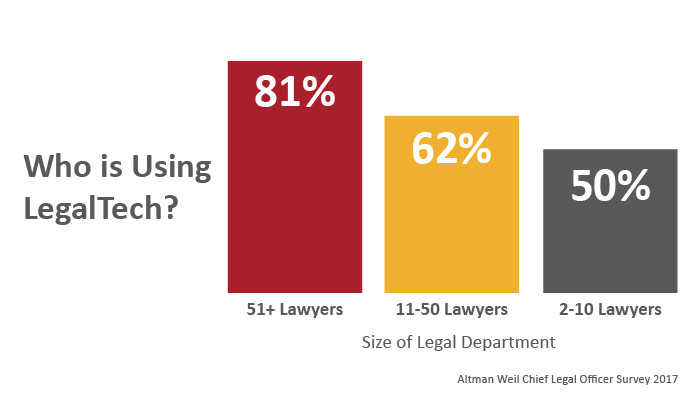 To be sure, small law departments aren’t a small sector of the in-house population: According to the Altman Weil survey, 49.6 percent of in-house legal teams have 10 lawyers or fewer. Why do smaller teams report a significantly lower use of technology tools? It comes down to time, according to three in-house lawyers we interviewed: Susannah Jobling Hodgens, Legal Counsel at Orora Limited; David Levy, Senior Supervising Counsel at TelstraSuper; and Patrick Hurley, Chief Administrative Officer and Chief Counsel of the Kansas City Area Transportation Authority. This trio shared their perspectives on the benefits and challenges of LegalTech – and advice for their small department compatriots. Indeed, the three lawyers agreed that in smaller departments, lawyers are expected to cover a broader range of subject areas. David said that it was necessary to be a “jack of all trades,” and that on a small team, there was a more acute need to prioritize work and balance competing interests and deadlines. The sizzle of tech aside, some tasks are more suited to a more traditional approach. Susannah said her department will continue to favor the human approach for complex contract review and company secretarial work. What’s on the small department LegalTech wish list? Two practical ways to start: Complete the Legal Operations Health Check to determine your department’s specific needs, then create an in-house Legal Technology Roadmap to prioritize your tech initiatives – and ensure they work together. Acknowledge LegalTech is worth the investment (and the investment may not be huge). Use technology to know what your team is doing – and show what your team is doing. Susannah also recommended using in-house legal operations software to categorise matters and chart how the legal team spends its time – for example, value-add matters vs. low-level work that could be handled differently. “This is a powerful message to show senior leaders how much time lawyers are spending on certain types of work,” she said. Share LegalTech outside the Legal Department.